Twelve people, including polio vaccinators, have been killed in two shootings at health centres in northern Nigeria, witnesses have said. In the first attack in Kano four polio vaccinators were shot dead by gunmen who drove up on a motor tricycle. Thirty minutes later gunmen opened fire at a health centre outside Kano city as women waited with their children. 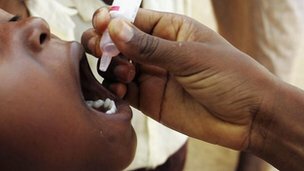 Some Nigerian Muslim leaders have previously opposed polio vaccinations, claiming they could cause infertility. On Thursday, a controversial Islamic cleric spoke out against the polio vaccination campaign, telling people that new cases of polio were caused by contaminated medicine. Some Kano residents said in the city that those injured at the health centre had been taken to hospital. It is not clear if health workers were among the casualties at the Hotoro health centre, where gunmen also approached using a motor tricycle. Kano banned motorbikes from carrying passengers after a recent attack on the prominent Muslim leader, the emir of Kano. Analysts believe the attacks may have been the work of the militant Islamist group Boko Haram but it has not yet commented. The group - whose name translates as "Western education is forbidden" - says it is fighting to overthrow the government and impose Sharia. It has been blamed for the deaths of some 1,400 people in central and northern Nigeria since 2010. Along with Afghanistan and Pakistan, Nigeria is one of only three countries where polio is still endemic. In the past month, polio workers have also been targeted and killed in Pakistan, where the Taliban have threatened anti-polio efforts - accusing health workers of working as US spies and alleging that the vaccine makes children sterile. sure dark generation still exist prominently in the north.